WOW caramel, marshmallow and chocolate in one delicious stick. These are very large pieces (4 bites at least). 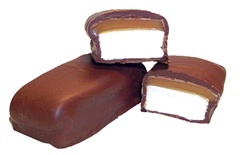 Soft marshmallow with a top layer of delicious caramel, covered in milk chocolate. These are large pieces of candy - about 4 pieces per 1/2 lb.